The firm’s over/unders are built on a triggerplate action and are available with a round or square body and optional sideplates. Peter Boxall brings computer-assisted design to fine gunmaking. The firm marries traditional fitting and finishing methods to machine-made components. Before looking at the process that makes this possible, it is worth considering the men themselves. Peter Boxall began shooting with his father in Warwickshire, England, using a .410. At 18 he took up sporting clays, followed by rifle target shooting. He has an engineering background with Jaguar but also worked for W. & C. Scott in Birmingham before joining Holland & Holland in London. James Edmiston attended the posh Rugby school before going to Oxford. He also has military experience with the Honorable Artillery Company, a territorial army regiment not dissimilar to the National Guard of the United States. While serving, he had a chance to shoot the Sterling sub-machine gun (SMG) and was hooked. He was impressed by its “mechanical beauty” as well as its power and reliability. A year later he acquired the company, and he continues to claim that the Sterling is the most reliable SMG ever made. The process starts with components manufactured in the Boxall & Edmiston factory, located in Shropshire in the village of Upton Magna. The company employs nine workers—two (plus an apprentice) in the machine shop, two (plus another apprentice) actioning, two stocking, two finishing and one doing service and general repair. Boxall & Edmiston barrels are machined in Upton Magna, and then sent together with their monoblock breech lump to a traditional British barrelmaker who strikes them up. They are returned several weeks later with the feel and weight distribution of barrels from a bespoke English game gun. The barrels and other machined components are handed to actioner Dan Walker, son of British gunwriter Lewis Potter. Walker assembles the metalwork of the gun, jointing and shaping the components per the customer’s order. He is assisted by third-year apprentice Jack Meredith, who has developed a flare for shaping components. The curvilinear contours of the over/under in particular are well thought through and in no way look remotely like those of a gun made on a machine. Meredith fits the internal components, and then works on the finished gun to make absolutely certain it functions as it should. In 2016 he won an “outstanding apprentice” award from SBC (formerly Shropshire Business Centres), a training company that controls and authenticates the apprentice-training scheme. Each gun takes weeks to assemble and is hand fitted. Major components have metal deliberately left so that classic smoke fitting can be used. A soot lamp is used to coat steel surfaces, to reveal high spots where opposing surfaces come into contact. These are then carefully removed with file and emery until they mate perfectly. Custom features, such as a left-hand-opening toplever or a single trigger are built into the gun at the actioning stage. All engraving is done in-house using both machinery and craft work. 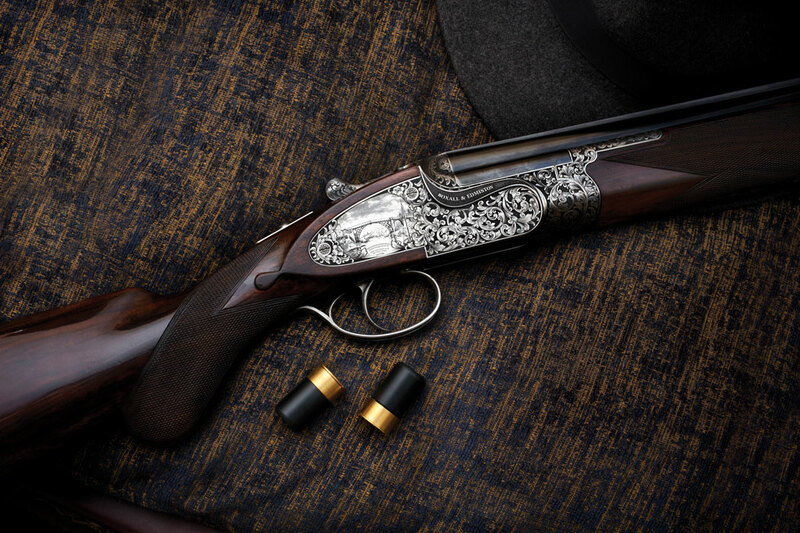 The machine engraving is particularly impressive and has been developed with help from some of the leading hand engravers whose understanding of technique, history and art have given Boxall & Edmiston guns an edge over other machine-engraved guns. 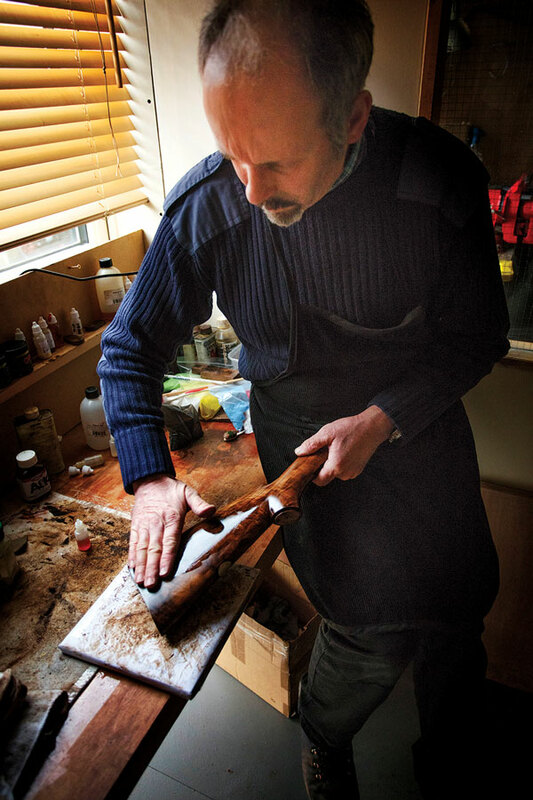 Peter Boxall himself is responsible for the design and cutting of the engraving, which has two basic options: house-style scroll, which is offered on the side-by-side, and a deeper-cut pattern, which is standard on the over/under. 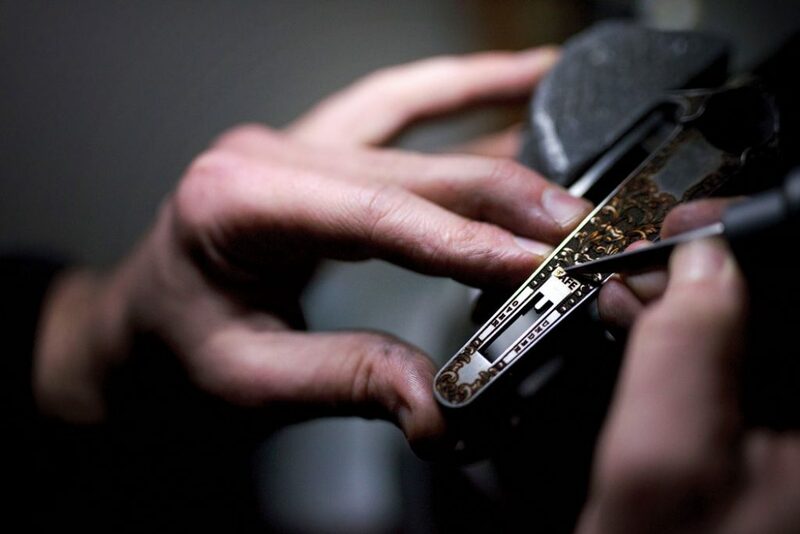 However, any bespoke engraving can be accommodated, such as vignettes on the lockplates, the base of the action, the trigger guard and/or the grip cap. Here Boxhall will work with client-supplied images of dogs, birds and so on. Finishing is accomplished by Andrew Dyke and assisted by Mark Leese, of whom Boxall says, “Andy Dyke has worked with weapons most of his life as a general-repair guy. His former business was AD Rifles. Mark is a close friend and has worked with Andy on many projects, so taking them both as a ‘team’ to finish our guns was good.” Their detailing of trigger pulls and ejector timing give the gun the feel of a more expensive handmade gun. We don’t actually focus on overall weight; it’s just one of the ways to create dynamics. Available models include boxlock and sidelock side-by-sides and a triggerplate over/under in 12, 16 or 20 gauge with a round or square body. A 28-gauge is also available but only as a round-body. As for weight, Boxall said, “We can create the dynamics to the client’s specification, not just weight but how [the gun] handles and works in the hands. The lightest 12-gauge over-and-under we make is 6 pounds 12 ounces, while the heaviest we have made is 8 pounds. 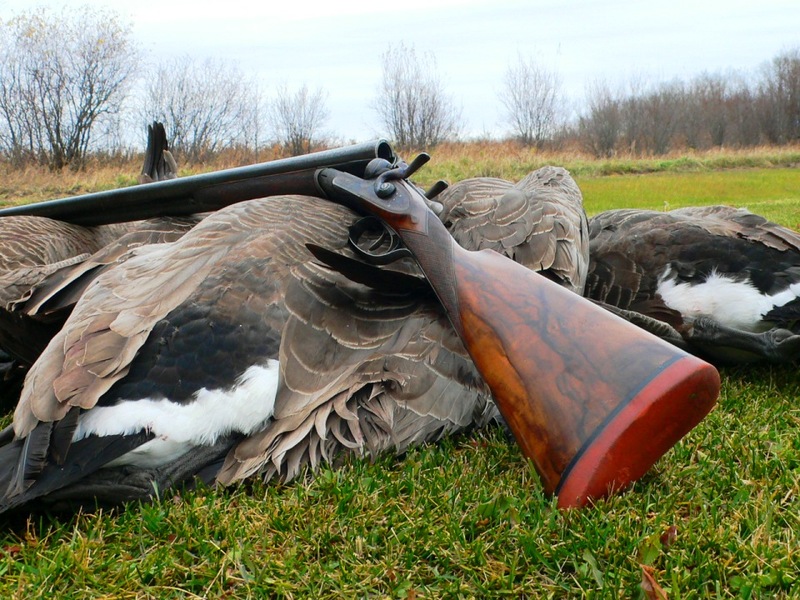 The lightest 20-gauge over-and-under made was 6 pounds 4 ounces, while the heaviest was 7 pounds. We change the dynamics, assuming the client knows what he wants—i.e. fast or control. We don’t actually focus on overall weight; it’s just one of the ways to create dynamics.” Boxall & Edmiston prides itself on being capable of creating a long-barreled, heavy, easily controlled gun for high driven pheasants or a light, fast and dynamic gun for driven grouse. The company currently makes 30 to 36 guns a year, with prices starting at £20,000 (about $27,500) without VAT for side-by-sides and £20,500 for over/unders. Of course, as with any bespoke gun, anything can be accomplished at an appropriate cost. Delivery time is 10 to 14 months, depending on options. A good game gun should have life and be responsive in the hand, which is not easily achieved in a purely machine-manufactured gun. But by combining craft and manufacturing, Boxall & Edmiston not only has created an original, it also has produced the first new British fine-gun design in decades priced closer to a soldier’s weapon than a bespoke gun. The company plans to launch in the US this year. For more information, contact Boxall & Edmiston. 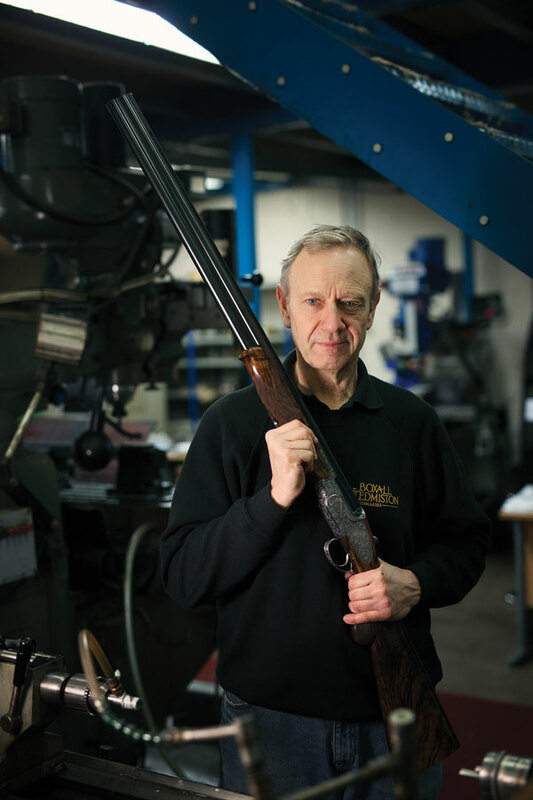 Doug Tate is an Editor at Large for Shooting Sportsman and is the author of British Gun Engraving (Safari Press, 2000). Are best at doing. Now if I can just sell my Purdey self-opener, I may get in line..